Are you looking for a soap making kit? There are different types of kits to consider depending on the soap making methods. Some kits contain ingredients to make homemade soap from scratch, while others use the melt and pour or no mix/no melt methods. Decide what type of kit you need. There are soap making kits for adults and children. First, let me explain a soap science lesson. 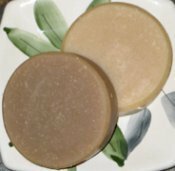 Homemade soaps, made from scratch, are formulated using a combination of emollient oils and butters, (avocado, olive, cocoa, shea) with lathering oils, (coconut, palm kernel). These oils are mixed with liquid saturated lye. A chemical reaction occurs between the oils and lye known as saponification. Once saponification is complete, there's no lye left in the mixture. Each type of oil requires a different amount of lye to produce the complete reaction. Why is this important? If you make homemade soap, from scratch, you use lye. Here's an example of a made from scratch soap making kit. It is meant to be used by adults, not children. It contains lye and essential oils. Caution should be heeded! CAUTION! Lye can cause, extremely, burning pains if it contacts your skin! Always, wear protective gloves, clothing, goggles, shoes, etc... when using lye. If you happen to get a lye burn, pour white vinegar on the burn to neutralize the lye. If you spill the lye, wipe the area with generous amounts of white vinegar to be sure all lye is neutralized. Keep lye away from children and pets. CAUTION! Essential oils are potent! Never use straight. Never use large amounts internally or externally. Dilute in carrier oil, soap, lotion or other buffering agent. Never use essential oils without knowing what their bio-active compounds can do. A melt and pour soaping kit is different than a made from scratch kit. These kits come in age categories for kids and adults. They can be fun activities for kids. Melted soap is hot, caution should be heeded. These soaping kits don't contain lye. Soap is made by melting bars of glycerin soaps included in the kits. Some soap making kits, for children, have glycerin soaps free of SLS, (sodium lauryl sulfate). There are no additives, dyes or synthetics used. Instead, natural ingredients are found in these soaping kits. Check the packaging ingredients or labels. There are soap kits designed for children that require no mixing, melting or pouring. There is no need to worry about hot melted soap. These soaps are formed by scented, soap clays. They come in age appropriate categories. Some adult supervision may be needed, depending on the age of the child. These can be fun activities for kids! Carefully read soap making instructions and ingredients with any soaping kit you purchase. Soap making equipment should be used age appropriately! Keep lye, essential oils, hot melted soap, soaping tools or any hazardous materials away from children and pets. CAUTION! Know potential hazards and protective cautions before making homemade soap.